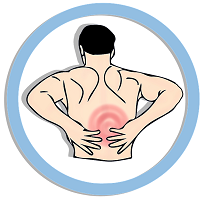 In most cases the reason that people suffer from back pain is due to things that they do on a daily basis. Of course, there are cases where the pain is due to an abnormality, but in the vast number of cases it is simply due to something that is completely preventable. Knowing these causes is the first step towards taking action in your life so that you can live free from pain. The number one cause of back pain is improper posture. This can be when you are sitting, standing or performing physical activity. It is common for people to begin to slouch, especially as they age. By making a mindful effort to keep your back straight throughout the day you can do a great deal to relieve the stress that slouching can put on your spine, discs and even back muscles. You will find that in just a few weeks of correcting your posture, it will become the new normal for you. Having poor posture when sitting can be especially detrimental to the health of your back. If you have a job that requires you to sit for extended time periods, it is best to have support that fits to the natural contours of your back. It is also ideal to take breaks on a regular basis so that you do not become stiff from being in one position for too long. Some even find using an exercise ball at their desks helps them to strengthen their back muscles and the need to remain balanced works to improve their posture without much thought at all. If you have a job that requires you to stand for long periods of time you should ask your manager if you can have a rubber mat to stand on. This helps to relieve pressure and makes it less likely that you will stand in ways that could strain your back. You may also want to consider investing in a back brace. This helps to keep your spine in alignment and prevent injury. Twisting or bending in the wrong fashion is one of the leading causes of back injuries on the job. These types of injuries can then lead to a life long battle with associated pain. How you sleep is also a major source of back pain problems for people. It isn’t thought about much due to how much sleep is just a natural part of our lives, but we spend around 8 hours a day in our beds. This clearly means that how we sleep and what type of support we have can impact our overall pain levels a great deal. Everyone prefers a different level of firmness to their mattress, which can largely depend on their weight distribution, but whatever type of mattress that you use, you want to be sure that it supports your spine’s natural alignment. The position that you sleep in is also very important. According to numerous studies, the best position to sleep is on your back. Sleeping on either side can through off your back’s alignment and sleeping on your stomach typically strains muscles in your back and shoulders. It can be difficult to make sleeping on your back a habit if you have slept a different way for most of your life, but doing so will help to reduce or even eliminate the pain that you experience. Some people recommend using pillows to posture yourself or having someone tuck you in very tightly for the first couple of weeks until it becomes a habit. Try whatever you can think of to help make this your new normal. You will not only be amazed at how much better you feel, but you will likely also a major increase in your quality of sleep. If you experience back pain, there is a good chance that by altering the way that you carry out your day to day activities you will experience less pain. The most important factor is taking the time to be mindful about how you sit, walk and sleep. Changing these patterns will almost definitely go a long way towards reducing your pain levels and increasing your quality of life. Erase Chronic Pain Review – Is This Program For You?